Dubai, UAE, August 08, 2018: This classic timepiece from COACH's Astor collection, boasts a classic style with the brands signature C design. 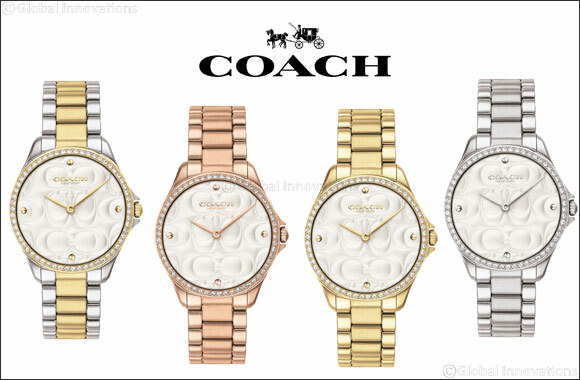 Like all Coach watches, this ladies' watch is crafted by a world-class watchmaker for accuracy and durability. The 31mm stainless steel set case boasts a silver white dial which is adorned with COACH's iconic C emblem with stainless steel accents. To keep you on time for all your appointments, the watch has been built with a quartz movement of a remarkably reliable calibre. A stainless steel bracelet with a deployment clasp closure keeps the watch comfortably secured to your wrist. Named after the historic street in New York City’s East Village, this slender bracelet watch is crafted from silver-tone stainless steel. A crystal-set bezel and engraved Coach Signature add a luxe touch. The Coach Astor collection are priced at AED 1195 and is available across Hour Choice stores in the UAE.